Busy Bee Eraser Pencil Toppers. Add these to your rubber Busy Bee Eraser Pencil Toppers to enjoy spring even when youre indoors! 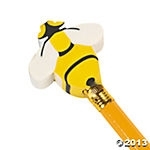 An unBEElievably fun way for kids to ornament their pencils, these 1 1/4" erasers are sure to be a welcome surprise at birthday parties or as a small spring reward during classroom activities and lessons. 1 1/4"